Lately I've been traveling a lot more and it's super important to pack everything you need. I hate having to buy unnecessary items when I'm traveling. 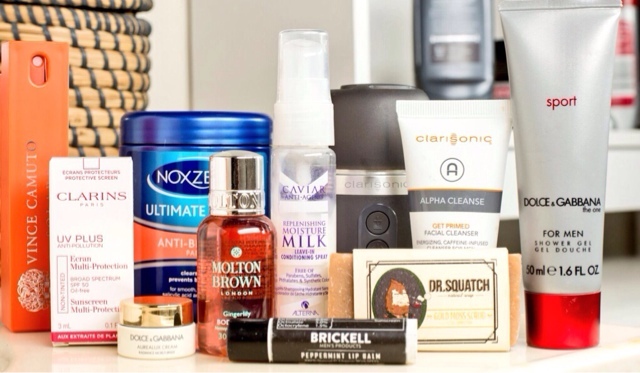 Here's my favorite products to travel with. Clarisonic Alpha Fit: The latest and greatest deep cleanser for men that washes away dirt, oil and sweat, It's the perfect size for travel. I like that it has two different settings based on whether you're clean shaven or rocking a beard. I use it about twice a week followed by a toner & moisturizer. Vince Camuto Solare Cologne : When traveling I usually have two different colognes one for the daytime & one for the night. This one is my daytime cologne it has a bit of an orange scent, but I prefer colognes that don't come with a super strong scented. Noxzema Face Pads: Sometimes when I shave my skin likes to pick fights and give me razor bumps. I honestly love these pads and have been using them for years. I definitely recommend buying them if you suffer from ingrown hairs,razor bumps. Clarins UV Plus Broad Spectrum : Many people have this misconception that they don't need sunscreen if they're a darker complexion or suffer from sun burns but sunscreen is so important, Skin cancer can happen to anyone at any age. I love this product because it's very light weight and doesn't leave that white residue like other sunscreen products. Brickell's Lip balm: I tend to use lip balm quite often, this one is great for locking in moisture and it has a pretty cool peppermint scent to it. Dolce & Gabbana Aurealux Radiance Moisture: I usually use this on nights or mornings when I've stayed up really late, I don't want any wrinkles or a dark circles under my eyes. Molton Brown Gingerlily Bodywash : So here's another body wash that I tend to use on occasion which are usually if I'm going out to a party or somewhere that I'm getting dressed up and I want that luxurious feeling. Dr.Squatch Bar soap: So this is one I haven't tried yet but definitely looking forward to using it. It came along in monthly subscription to Sprezzabox. I'll def give it a try with an updated review.